The raison d'être of these two sets (and most of the playing time) is the Skrowaczewski Minnesota recordings. These are aptly-judged performances captured in a warm-haloed acoustic. All the tendresse you could ask for is there. Magic abounds in Ma Mère l'Oye - with touching music subtly and lovingly projected. This is an adult's dream of a childhood fairy realm rising to a very adult-seeming ecstasy in the rampant bell-climax (from 25.54) of the Le Jardin Féerique. I recall a similar impact made by a concert performance given by Louis Frémaux and the City of Birmingham SO in the 1970s. And my how those closing pages suggest Bernard Herrmann's indebtedness to Ravel (Marnie, for example)! 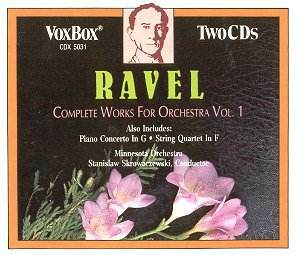 Of course, Herrmann recorded several Ravel works for Decca Phase Four. A pity that Vox did not separately band Ma Mère l'Oye. The muttered 'engine-room' sinister opening of La Valse contrasts with the rippling and swirling luxury of the dance and the later glorious derivatives of Richard Rodgers (Out of my dreams), Stephen Sondheim (A Little Night Music) and Samuel Barber (Souvenirs). Valses nobles et valses sentimentales is glowingly done and prompts similar recollections. The Menuet Antique reminded me of Reger's ancient dances and Rubbra's Virginal meditations. The Minnesotans (whose partnership with Skrowaczewski lasted from 1960 to 1985) are joined by the St Olaf Choir for the two Daphnis collations. This is a work which has spawned many in like style including Janis Ivanovs' Symphony No. 4 and Bax's Spring Fire symphony not to mention 'cartloads' of film music. It is ripplingly, voluptuously and subtly done - best sampled in the Lever du Jour at the start of suite no. 2. The Ballet Russes Polovtsi-style voices in the Danse Générale are not undersold - extremely exciting work from everyone - both choir and orchestra. The Fanfare from Eventail de Jeanne is a cheeky Stravinskian toy. Provincial delicacy and pastoral charm distinguishes Skrowaczewski's Tombeau - making it the most appealing of experiences. The Rapsodie Espagnole is sold for every drop of explosive sultriness. The mystery of the opening links across with the tense calm of Stravinsky's Rite of Spring. A pity that the four sections of the Rapsodie were not distinctly banded. The Alborada might almost be another movement of the Rapsodie. My only slight reservation centres on the Boléro (a minimalist work ahead of its time and in years to come to provide Basil Poledouris with inspiration for his bacchanale scene from Conan the Barbarian and Shostakovich for his Leningrad Symphony) which in a catalogue not poor in classic accounts did not have that special mesmeric singleness of purpose associated with the best. It is, however, a good account with some lovingly poised woodwind work. The Pavane steps like slow motion rain - the quintessential solution of comforting sorrow distanced by time and perfect beauty. Douglas Bostock's ClassicO version, very differently coupled, is exceptional but this version is in the same company and with a better orchestra. Une Barque sur l'Océan swells and sways in animalistic sympathy with the surge and the surf. Skrowaczewski vividly limns the undulations and the rushes of the riptide. If you enjoy this try Louis Aubert's Le Tombeau de Chateaubriand on a Marco Polo disc. The two piano concertos are finely done by Abbey Simon and the Luxembourgers. This is best appreciated with the volume setting high. The tender marine dreams and seaweed hallucinations of the G major work are brilliantly done. Sensitivity and response to mood change are not lacking. A timeless sense of undimmed beauty hangs over the miraculous middle movement. A brash jazziness in the flanking movements is not toned down. Against the G major work the left-hander seems almost nondescript. After this experience I am keen to hear Simon in the Rachmaninov piano concertos. The Quartet opens nostalgic, and sometimes disturbing, doors in the memory. It remains a staple of the repertoire - totally unacademic, vivid (the hell-for-leather finale is electric in its intensity) and moving - qualities glowingly projected by the New Hungarian Quartet who avoid any suspicion of going through the motions. This is a connoisseur's collection with the most evident strengths lying in the Minnesota contribution. The recordings are circa 25-30 years old and greater transparency is on offer from a host of digital collections. What most of the competition cannot produce is such balance and sensitivity. For all their years the technical handiwork of Mark Aubort and Joanna Nickrenz has a naturalness and lightness of touch few recordings can rival. Recommended - a superb bargain. All of this is offered in two lowest-priced collections. 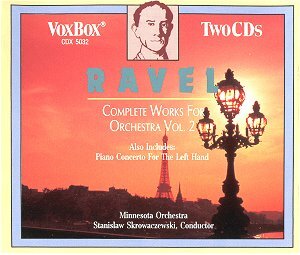 An outstanding bargain with four hours of the twentieth century's most provocatively impressionistic music on offer at bargain price. It is to Vox's credit that they have added the string quartet and have maintained excellent notes by Harry Halbreich no less.